This article is about recordings released after Hendrix's death. For releases during Hendrix's lifetime, see Jimi Hendrix discography. Jimi Hendrix was an American musician whose career spanned from 1962 to 1970. His posthumous discography includes recordings released after September 18, 1970. Hendrix left behind a large number of recordings in varying stages of completion. This material, along with reissues of his career catalogue, has been released over the years in several formats by various producers and record companies. Since Experience Hendrix, a family company, took control of his recording legacy in 1995, over 15 Hendrix albums have appeared on the main US albums chart. Several of these have also placed on charts in more than 18 countries around the world. At the time of his death, Hendrix was recording songs for a fourth studio album. He was working on enough material for a double album and had sketched out possible track lists. However, only about six songs were nearing completion, with an additional twenty or so in different stages of development. The first attempt at presenting Hendrix's fourth studio album, a single LP record titled The Cry of Love, was released in 1971 and reached number three on Billboard's album chart. A second attempt titled Voodoo Soup, with some different songs and a new audio mix, was released in 1995 and appeared at number 66. In 1997, Experience Hendrix restored the original mixes and added several songs for a third release: the double-album length First Rays of the New Rising Sun, the first to use one of Hendrix's proposed titles, reached number 49. In addition to songs planned for a fourth studio album, numerous demos, studio outtakes/alternate takes, and jams have been released. Albums of concert performances and compilations focusing on various aspects of Hendrix's work have been issued. From 1970 to 1992, his record companies Reprise Records in the US and Track Records/Polydor Records in the UK continued to handle his recordings. MCA Records took over in 1992, during the controversial tenure of subsequent producer Alan Douglas. Since 2010, Sony/Legacy Recordings has been distributing the releases produced by Experience Hendrix. Besides legitimate releases, a large number of bootleg and grey market albums have appeared over the years. Many of these have been reissued several times with different album titles, packaging, and song titles. Some purporting to feature Hendrix as a sideman have been shown to be fake. To meet the demand, Dagger Records was established in 1998 to issue "official bootlegs" of albums "that don't meet the technical recording criteria" and standards for mainstream release. These have included live recordings from various points in his career as well as demo and rehearsal recordings. 1970 "Voodoo Chile [sic]" / "Hey Joe" & "All Along the Watchtower"
"Angel" / "Night Bird Flying"
"Dolly Dagger" / "The Star-Spangled Banner"
"Gypsy Eyes" / "Remember" / "Purple Haze" / "Stone Free"
1972 "Johnny B. Goode" / "Lover Man"
"Johnny B. Goode" / "Little Wing"
"The Wind Cries Mary" / "Little Wing"
1973 "Hear My Train A Comin'" / "Rock Me Baby"
1982 "Fire" / "Little Wing"
"Fire" / "Are You Experienced?" 1990 "Crosstown Traffic" / "Voodoo Chile [sic]"
"All Along the Watchtower" / "Voodoo Chile [sic]" / "Hey Joe"
1997 "Dolly Dagger" / "Night Bird Flying"
1999 "The Star-Spangled Banner" / "Purple Haze"
"Love or Confusion" / "12 Bar with Horns"
2011 "Fire" / "Touch You"
"Johnny B. Goode" / "Purple Haze"
"Like a Rolling Stone" / "Spanish Castle Magic"
2012 "Can You Please Crawl Out Your Window?" / "Burning of the Midnight Lamp"
"Come On (Let The Good Times Roll)" / "Calling All the Devil's Children"
"Dolly Dagger" / "Star Spangled Banner"
2015 "Purple Haze" / "Freedom"
2018 "Mannish Boy" / "Trash Man"
"The Little Drummer Boy" / "Silent Night" / "Auld Lang Syne"
Notes: Limited edition box set of first 5 UK singles, plus "Voodoo Chile [sic]" / "Gloria"
"Hey Joe" / "Stone Free"
"Purple Haze" / "51st Anniversary"
"The Wind Cries Mary" / "Highway Chile"
"Burning of the Midnight Lamp" / "The Stars That Play with Laughing Sam's Dice"
"All Along the Watchtower" / "Long Hot Summer Night"
"Voodoo Chile [sic]" / "Gloria"
"Voodoo Chile (Slight Return) [sic]"
Pete Townshend and Eric Clapton Narration / "Red House"
Jimi Hendrix Narration / "Drivin' South"
"(I'm Your) Hoochie Coochie Man"
Notes: Promo sampler for Live at Woodstock, CD has extra track "Spanish Castle Magic"
"Sgt. Peppers Lonely Hearts Club"
"Dear Mr. Fantasy (Part One)"
"Dear Mr. Fantasy (Part Two)"
Dagger Records was established in 1998 by Experience Hendrix to issue "official bootlegs" of albums "that don't meet the technical recording criteria" and standards for mainstream release. Curtis Knight & the Squires "Ballad of Jimi" / "Gloomy Monday"
1971 The Squires "No Such Animal Part 1" / "No Such Animal Part 2"
1984 Lightnin' Rod "Doriella Du Fontaine" / "Doriella Du Fontaine (instrumental)"
^ Woodstock Two: Various artists, Hendrix performs "Jam Back at the House", "Izabella", "Get My Heart Back Together"
^ Message to Love: Various artists, Hendrix performs "Voodoo Child (Slight Return)"
^ "Valleys of Neptune" alternate second track: "Peace in Mississippi"
^ "Bleeding Heart" alternate second track: "Peace In Mississippi"
^ "Somewhere" alternate second track: "Power of Soul"
^ McDermott, Kramer & Cox 2009, pp. 22, 247. ^ a b c Unterberger, Richie. "Jimi Hendrix: Artist Biography". AllMusic. Retrieved October 1, 2014. ^ "Experience Hendrix". JimiHendrix.com (official website). Experience Hendrix. Retrieved October 1, 2014. ^ a b c d e f g h i j "Jimi Hendrix: Chart history". Billboard.com. Retrieved March 5, 2017. "Jimi Hendrix in Australian Charts". australian-charts.com. Hung Medien. Archived from the original on July 7, 2014. Retrieved June 21, 2014. "Jimi Hendrix in the Austrian Hitparade". austriancharts.at (in German). Hung Medien. Archived from the original on July 7, 2014. Retrieved June 21, 2014. "Jimi Hendrix: Top Singles RPM (Canada)". collectionscanada.gc.ca. RPM. Retrieved June 21, 2014. "Jimi Hendrix: Top Albums/CDs RPM (Canada)". collectionscanada.gc.ca. RPM. Retrieved June 21, 2014. "Jimi Hendrix in Danish Charts". danish-charts.com. Hung Medien. Archived from the original on October 6, 2014. Retrieved June 21, 2014. "Jimi Hendrix in Finnish Charts". finnishcharts.com. Hung Medien. Archived from the original on October 6, 2014. Retrieved June 21, 2014. "Jimi Hendrix in German Charts". charts.de (in German). GfK Entertainment Charts. Retrieved June 21, 2014. "Jimi Hendrix Single-Charts". musicline.de (in German). PHONONET. Retrieved June 21, 2014. "Jimi Hendrix Longplay-Charts". musicline.de (in German). PHONONET. Retrieved June 21, 2014. "Jimi Hendrix in Dutch Charts". dutchcharts.nl (in Dutch). Hung Medien. Retrieved June 21, 2014. "Jimi Hendrix chart history – Japan Hot 100". Billboard.biz. Billboard. Retrieved June 21, 2014. "Jimi Hendrix in New Zealand Charts". charts.org.nz. Hung Medien. Archived from the original on October 6, 2014. Retrieved June 21, 2014. "Jimi Hendrix in Norwegian Charts". norwegiancharts.com. Hung Medien. Archived from the original on March 8, 2014. Retrieved June 21, 2014. "Jimi Hendrix in Swedish Charts". swedishcharts.com. Hung Meiden. Retrieved June 21, 2014. "Jimi Hendrix in Swiss Hitparade – Charts (also shows French chart positions)". hitparade.ch. Hung Medien. Archived from the original on December 26, 2008. Retrieved June 21, 2014. ^ McDermott & Kramer 1992, p. 294. ^ Roby 2002, pp. 207–208. ^ McDermott & Kramer 1992, pp. 274–275. ^ Roby 2002, p. 207. ^ McDermott & Kramer 1992, pp. 274–276. ^ Shapiro & Glebbeek 1990, p. 441. ^ Roby 2002, pp. 208–209. ^ Roby 2002, p. 266. ^ a b Shapiro & Glebbeek 1990, pp. 539–553. ^ "Sony Music Entertainment and Experience Hendrix announce an exclusive licensing partnership for legendary Jimi Hendrix catalog". JimiHendrix.com (official website). Experience Hendrix. August 28, 2010. Retrieved October 1, 2014. ^ McDermott 1998, p. 4. ^ Shapiro & Glebbeek 1990, pp. 569–585. ^ Shapiro & Glebbeek 1990, pp. 569, 574. ^ Roby 2002, p. 26. ^ a b McDermott 1998, p. 1. ^ a b "The Dagger Records Story". DaggerRecords.com. Experience Hendrix. Retrieved July 28, 2008. ^ a b c d e f g h i j Shapiro & Glebbeek 1990, Appendix 1: Music, Sweet Music: The Discography, pp. 523–621. 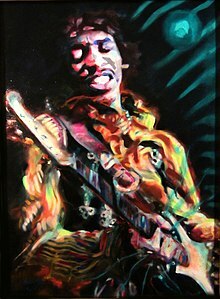 ^ a b c d e f "Jimi Hendrix". Official Charts. Retrieved March 17, 2018. ^ a b Shapiro & Glebbeek 1990, p. 539. ^ a b c d e f g h i j k l "Gold & Platinum Search – Jimi Hendrix". RIAA. Archived from the original on February 1, 2013. Retrieved October 1, 2014. ^ McDermott, Kramer & Cox 2009, p. 249. ^ Shapiro & Glebbeek 1990, p. 542. ^ a b c Shapiro & Glebbeek 1990, p. 544. ^ Shapiro & Glebbeek 1990, pp. 546–547. ^ Shapiro & Glebbeek 1990, p. 547. ^ Shapiro & Glebbeek 1990, p. 549. ^ a b c Shapiro & Glebbeek 1990, p. 551. ^ a b c d e f g h i j k l Shadwick 2003, p. 254. ^ "Valleys of Neptune Available March 9, 2010". JimiHendrix.com (official website). Experience Hendrix. January 31, 2010. Retrieved October 7, 2014. ^ "Jimi Hendrix People, Hell and Angels Album Revealed at Rolling Stone". JimiHendrix.com (official website). Experience Hendrix. November 20, 2013. Retrieved October 7, 2014. ^ "New Jimi Hendrix Studio Album, 'Both Sides of the Sky,' Coming This March (New album features 10 previously unreleased tracks, recordings by the Jimi Hendrix Experience and Band of Gypsys...)". guitarworld.com. guitarworld.com / Jackson Maxwell. December 7, 2017. Retrieved December 9, 2017. ^ Caulfield, Keith (March 18, 2018). "Logic Scores Second No. 1 Album on Billboard 200 Chart With 'Bobby Tarantino II'". Billboard. Retrieved March 19, 2018. ^ Shapiro & Glebbeek 1990, pp. 537–538. ^ a b c Shapiro & Glebbeek 1990, p. 540. ^ Shapiro & Glebbeek 1990, pp. 541–542. ^ a b Shapiro & Glebbeek 1990, p. 541. ^ a b Shapiro & Glebbeek 1990, p. 543. ^ Shapiro & Glebbeek 1990, p. 552. ^ Shapiro & Glebbeek 1990, p. 538. ^ a b c Shapiro & Glebbeek 1990, p. 553. ^ Shapiro & Glebbeek 1990, p. 536. ^ Shapiro & Glebbeek 1990, p. 554. ^ Shapiro & Glebbeek 1990, p. 555. ^ a b c d e f g "BPI Certified Awards – Search 'Hendrix'". British Phonographic Industry. Archived from the original on February 6, 2013. Retrieved October 1, 2014. ^ Shapiro & Glebbeek 1990, p. 558. ^ Shadwick 2003, pp. 253–254. ^ Henderson, Alex. "Jimi Hendrix: Live: Isle of Wight '70 – Review". AllMusic. Retrieved July 18, 2016. ^ Unterberger, Richie. "Various Artists: Message to Love: The Isle of Wight Festival 1970 – Review". AllMusic. Retrieved November 11, 2014. ^ Ruhlmann, William. "Jim Hendrix/The Jimi Hendrix Experience: Live at Monterey – Review". AllMusic. Retrieved November 11, 2014. ^ "Experience Hendrix LLC & Legacy Recordings Launches Fourth Wave of Releases in Critically Acclaimed Jimi Hendrix Catalog Project". JimiHendrix.com (official website). Experience Hendrix. June 16, 2011. Retrieved October 7, 2014. ^ "Jimi Hendrix Hear My Train A Comin And Miami Pop Festival Available Today! Tune In to PBS Tonight!". JimiHendrix.com (official website). Experience Hendrix. November 5, 2013. Retrieved October 7, 2014. ^ Kreps, Daniel (August 3, 2015). "New Jimi Hendrix Documentary Focuses on Historic Atlanta Pop Concert". Rollingstone.com. Retrieved August 4, 2015. ^ Grow, Kory (August 9, 2016). "Hear Jimi Hendrix's Electrifying First Band of Gypsys Performance". Rollingstone.com. Retrieved August 9, 2016. ^ a b Shapiro & Glebbeek 1990, p. 546. ^ "Jimi Hendrix: Re Experienced – Overview". AllMusic. Retrieved July 18, 2016. ^ a b Shapiro & Glebbeek 1990, p. 550. ^ "Jimi Hendrix: Stone Free – Overview". AllMusic. Retrieved July 18, 2016. ^ "Jimi Hendrix: Cornerstones: 1967–1970 – Overview". AllMusic. Retrieved November 11, 2014. ^ Shadwick 2003, p. 253. ^ Owens, Thom. "Jimi Hendrix: The Ultimate Experience – Review". AllMusic. Retrieved November 11, 2014. ^ a b "Gold/Platinum". Music Canada. Retrieved November 30, 2014. ^ Egan, Brian. "The Jimi Hendrix Experience: The Experience Collection – Review". AllMusic. Retrieved November 17, 2014. ^ Eder, Bruce. "Jimi Hendrix: Experience Hendrix: The Best of Jimi Hendrix – Review". AllMusic. Retrieved November 11, 2014. ^ "Trofeer" (in Norwegian). IFPI Norway. Archived from the original on November 5, 2012. Retrieved November 30, 2014. ^ Planer, Lindsay. "Jimi Hendrix: Voodoo Child: The Jimi Hendrix Collection – Review". AllMusic. Retrieved November 11, 2014. ^ Westergaard, Sean. "Jimi Hendrix: The Singles Collection – Review". AllMusic. Retrieved November 11, 2014. ^ Unterberger, Richie. "Jimi Hendrix: Martin Scorsese Presents the Blues: Jimi Hendrix – Review". AllMusic. Retrieved November 11, 2014. ^ Leggett, Steve. "Jimi Hendrix: Fire: The Jimi Hendrix Collection – Review". AllMusic. Retrieved November 17, 2014. ^ "Legacy Recordings & Experience Hendrix LLC Announce the Release of West Coast Seattle Boy – The Jimi Hendrix Anthology Available Tuesday, November 16". JimiHendrix.com (official website). Experience Hendrix. September 13, 2010. Retrieved October 7, 2014. ^ "Jimi Hendrix: Chart history". Billboard.com. Retrieved March 5, 2017. ^ a b c Belmo & Loveless 1998, p. 32. ^ Belmo & Loveless 1998, p. 34. ^ "The debut single 'Valleys of Neptune' now available as 7" Single and Digital download". JimiHendrix.com (official website). Experience Hendrix. February 2, 2010. Retrieved October 7, 2014. ^ "'Bleeding Heart' 7" Vinyl Single Coming to Stores June 15th". JimiHendrix.com (official website). Experience Hendrix. May 12, 2010. Retrieved October 7, 2014. ^ "Jimi Hendrix 'Love or Confusion' Hits No. 4 on Singles Sales Chart". JimiHendrix.com (official website). Experience Hendrix. October 6, 2010. Retrieved October 7, 2014. ^ "Jimi Hendrix: Fire – Overview". AllMusic. Retrieved November 11, 2014. ^ "Jimi Hendrix: Johnny B. Goode – Overview". AllMusic. Retrieved November 11, 2014. ^ "Sundazed and Experience Hendrix Recapture the Jimi Hendrix Vinyl Experience!". JimiHendrix.com (official website). Experience Hendrix. April 12, 2012. Retrieved October 7, 2014. ^ "The Second Iinstallment in Sundazed's Landmark Jimi Hendrix Singles Series!". JimiHendrix.com (official website). Experience Hendrix. July 9, 2012. Archived from the original on February 10, 2013. Retrieved October 7, 2014. ^ "New Jimi Hendrix Single 'Somewhere' – Available Now". JimiHendrix.com (official website). Experience Hendrix. February 5, 2013. Retrieved October 1, 2014. ^ Shapiro & Glebbeek 1990, pp. 566–567. ^ Shapiro & Glebbeek 1990, p. 557. ^ a b c d Belmo & Loveless 1998, p. 48. ^ Belmo & Loveless 1998, p. 54. ^ "Jimi Hendrix – Live at the Fillmore East [Sampler]". AllMusic. Retrieved November 13, 2014. ^ a b "Jimi and the Band of Gypsys Debut at #4 with 'Merry Christmas and Happy New Year'". JimiHendrix.com (official website). Experience Hendrix. December 6, 2010. Retrieved October 7, 2014. ^ "Dagger Discography". DaggerRecords.com. Experience Hendrix. Retrieved April 20, 2014. ^ a b "Concert Broadcasts". JimiHendrix.com (official website). Experience Hendrix. Retrieved July 19, 2016. ^ a b Shapiro & Glebbeek 1990, p. 588. ^ "Stephen Stills – Albums". Official Charts. Retrieved October 1, 2014. ^ Shapiro & Glebbeek 1990, pp. 588–589. ^ Shapiro & Glebbeek 1990, pp. 570–571. ^ Shapiro & Glebbeek 1990, pp. 573–574. ^ Shapiro & Glebbeek 1990, p. 574. ^ Shapiro & Glebbeek 1990, p. 572. ^ "You Can't Use My Name – The RSVP/PPX Sessions To Be Released March 24". JimiHendrix.com (official website). Experience Hendrix. February 18, 2015. Retrieved February 25, 2015. ^ "Dagger Records Releases 'Live At George's Club 20' Featuring Jimi Hendrix". JimiHendrix.com (official website). February 28, 2017. Retrieved April 12, 2017. ^ McDermott 2010, p. 43. ^ Shapiro & Glebbeek 1990, p. 581. ^ Shapiro & Glebbeek 1990, p. 580. Belmo; Loveless, Steve (1998). Jimi Hendrix: Experience the Music. Burlington, Ontario: Collector's Guide Publishing. ISBN 1-896522-45-9. Jimi Hendrix Encyclopedia (2012). "Jimi Hendrix Encyclopedia". JimiHendrix.com (official website). Experience Hendrix. Retrieved June 21, 2014. McDermott, John; Kramer, Eddie (1992). Hendrix: Setting the Record Straight. New York City: Warner Books. ISBN 0-446-39431-9. McDermott, John; Cox, Billy; Kramer, Eddie (1995). Jimi Hendrix: Sessions. New York City: Little, Brown. ISBN 0-316-55549-5. McDermott, John (1998). Live at the Oakland Coliseum (CD notes). Jimi Hendrix Experience. Seattle, Washington: Dagger Records. 08802-11743. McDermott, John; Kramer, Eddie; Cox, Billy (2009). Ultimate Hendrix. New York City: Backbeat Books. ISBN 0-87930-938-5. McDermott, John (2010). West Coast Seattle Boy: The Jimi Hendrix Anthology (CD/DVD set booklet). Jimi Hendrix. New York City: Legacy Recordings. 88697769272. Roby, Steven (2002). Black Gold: The Lost Archives of Jimi Hendrix. New York City: Billboard Books. ISBN 0-8230-7854-X. Roby, Steven; Schreiber, Brad (2010). Becoming Jimi Hendrix. Cambridge, Massachusetts: Da Capo Press. ISBN 978-0-306-81910-0. Shadwick, Keith (2003). Jimi Hendrix: Musician. San Francisco: Backbeat Books. ISBN 0-87930-764-1. Shapiro, Harry; Glebbeek, Cesar (1990). Jimi Hendrix: Electric Gypsy. New York City: St. Martin's Press. ISBN 0-312-05861-6. Whitburn, Joel (2008). Joel Whitburn Presents: Across The Charts The 1960s. Menomonee Falls, Wisconsin: Record Research. ISBN 978-0898201758. This page was last edited on 28 March 2019, at 14:51 (UTC).